Coffee is good. BPA, a chemical called Bisphenol A, is not. So, why would you want it in your coffee? If you want a smooth, perfect cup of joe, then read my best coffee makers BPA-Free list below! But first, what is BPA and why should I avoid it? BPA is an industrial chemical used in the production of plastics. When humans ingest it, it acts as an endocrine disruptor and has been implicated in a variety of health issues. I’m not going to get into that here, but you should know there is a greater chance of ingesting it if your coffee maker is not BPA-free. Why? Because BPA is released when the hot liquid comes into contact with plastic. Since most coffee makers involve plastic in some way, this means that unless your machine is BPA-free, you could be drinking more than just beans and water. If you don’t have one yet, no worries. I’ve found the best ones to recommend today. I picked four BPA-free coffee makers that online reviewers love that will brew a flavorful cup without any unwanted surprises. At the end, I’ll give you a cheat sheet to compare the different models. 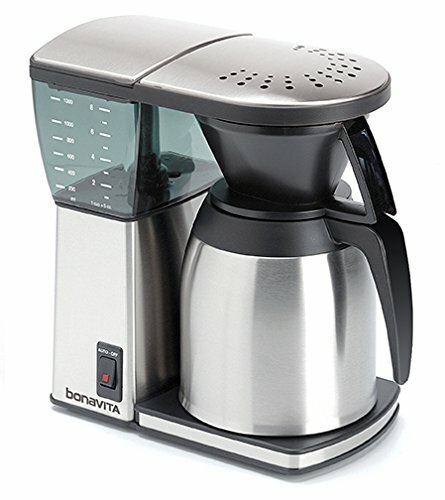 PROS: Reviewers love the ability to control their cup of coffee with this maker both in brew strength and its temperature. It has a user-friendly control panel with one reviewer saying it’s so easy a child could figure it out. Like most Cuisinart models, it has a charcoal filtration system with replaceable pods that filters the water before brewing. Some reviewers believe the filtration system is why Cuisinart coffee always tastes so good. Because of its water filtration system, this can also be a decent tea maker as well as the water comes out quite hot. Taste: Coffee in the 3200 is more flavorful. A new machine might be expected to be better, but I think they’ve gotten the flow and temperature of the brewing process better. Temperature: The brewed coffee is much hotter. Both units have three temperature settings for the hot plate, but the settings on the 3200 are hotter. Size and Capacity. The 3200 handles 14 cups compared to the 1200’s 12 cups. Yet as you can see from the photos, they are the same height to fit on a counter. They seem to get the extra capacity by making the 3200 a little deeper from front to back. We’ve been surprised at how useful the extra capacity is. Carafe: The new glass carafe is just like the old one, only larger. It pours nicely with or without the lid on it. The new lid works the same as the old one, popping off and on. (I read some complaints about the lid on an intervening model with a spring opening, but if so, they fixed that by going back to the 1200 style). CONS: The lid of the water reservoir doesn’t open far enough to use the coffee pot to fil it which frustrates some users. Others say the cord is too short which limits where you can place the machine. There is not a lot of negative feedback but some don’t appreciate the taste the coffee makes, or find the reservoir leaks at times. Every single time we make coffee with this it comes out tasting burnt and bitter. We have run vinegar and water through several times to clean it. Not happy at all. Will be returning. Question: How long is the brew time? Question: Can you take the carafe out and pour a cup of coffee before it is totally finished brewing (without it continuing to drip)? Question: Can you just brew hot water for tea? Verdict: If you want a customizable cup, this BPA-free maker should be at the top of your list. PROS: This alternative to carafe-based machines is a good option for people that don’t want to rush their daily cup, or cups, of joe. Reviewers like that by eliminating the carafe there’s no chance of the coffee tasting burnt from sitting in glass on a hot plate for too long. People like the convenience of this system and don’t miss the mess that a carafe can sometimes make while pouring a cup. CONS: The machine has a short plug, and some people claim it’s difficult to tell how much coffee is being poured into the cup. While there is no carafe to clean on a regular basis, you still must clean both the coffee and water reservoir and maintain the filter like any other machine which some people find cumbersome. Verdict: This coffee maker is ideal for those that want coffee on demand without using a pod-based single-serve coffee system. If you don’t want to rush your daily cup(s), this machine is right for you. Question: Does this come with the travel mug as pictured? Question: will it reheat old coffee? Answer: yes you just hold the power button down/in for 2-3 seconds to bypass brew. Question: Would I be harming the machine in any way if I only used this machine for one cup of coffee per day every day? Answer: It has a button on left side of coffee maker that lets you select 1-4 or 1-3 cups. I have used mine to make a single cup without any issues. Question: Can you set an alarm for the coffee maker to begin brewing automatically in the morning? Answer: The coffee maker can be pre-programmed to turn on at a specified time. It has the ability to be set to stay on for 1,2,3, or 4 hours and can be set to regular or bold strength. Answer:The coffee maker can be pre-programmed to turn on at a specified time. It has the ability to be set to stay on for 1,2,3, or 4 hours and can be set to regular or bold strength. 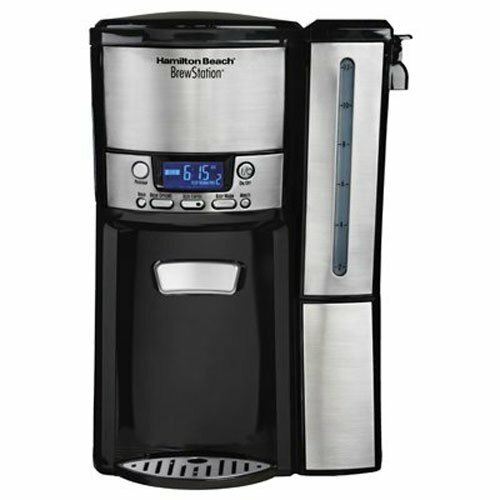 The Hamilton Beach 12-Cup Coffee Maker! What a great Deal!!! WOW what a deal! 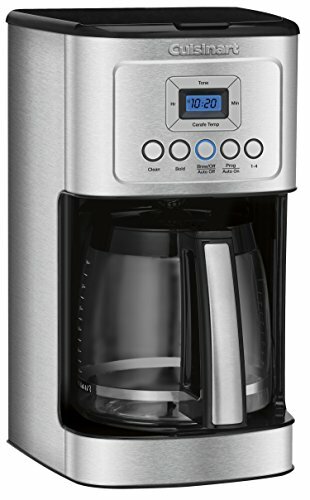 When I received notice of The Hamilton Beach 12-Cup Coffee Maker on sale, I read the reviews and decided to purchase it. I finally used it today and was very very impressed. I used Santo Domingo ground coffee and it was exactly as I wanted. I followed all the instructions and l cleaned the machine before using it. I then proceeded to fill the carrying tank with water for 12 cups, poured it into the machine placed the empty tank on top, inserted the filter and placed seven heaping tablespoons into the filter. Closed the container, pressed the strong brew and on button. Minutes later a very full body and hot mug of coffee. What I love the most was the fact that there is no carafe! The coffee is brewed inside and stored by a warming place for up to four hours. It kept it hot! 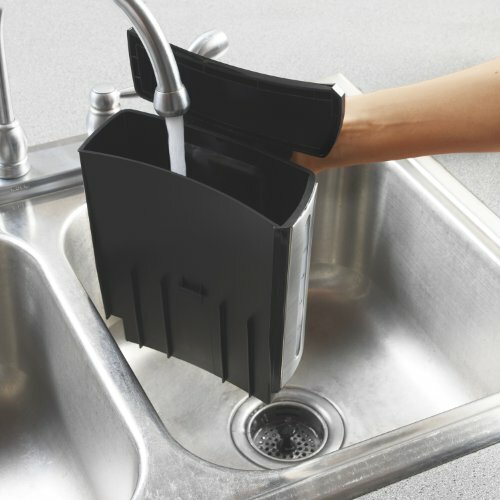 Being able to take a mug or a cup and just pour what you want is such a great idea and it works well. At the end, when we were finished all 12 cups, cleanup was simple and we set the machine on to a timer for tomorrow morning. Very pleased with this machine and you will as well. Works and tmakes good coffee. You have to get used to filling a “bucket” with water, instead of a carafe, but it keeps the coffee warmer and is easy to serve. Two design challenges: 1. you serve the coffee by pressing the rim of your cup against a bar that requires a medium amount of pressure and sometimes the whole machine slides or tips backwards from the pressure. 2. The bar is up under the holding tank enough that the lighting angle in our kitchen does not get light into the serving area, so you can’t really see how full the cup is while you are serving. A small light source up under the tank would be a great improvement. PROS: People applaud the simplicity of this coffee maker. They say the control panel is easy to use, it’s a breeze to clean, and the coffee tastes great. Many commented on the attractive design and are pleased this small coffee maker doesn’t dominate their countertop. CONS: Some claim the carafe doesn’t keep the coffee steaming hot and believe it loses heat the longer it sits. They also advise not to use the carafe to fill the machine since it drips once you try to empty the water into the reservoir. Reviewers also wish it came with a brew pause feature to grab a cup before the seven minutes to brew an entire carafe is up. Verdict: If you need a compact coffee maker and aren’t concerned about it being piping hot each time, this coffee maker might be the one for you. 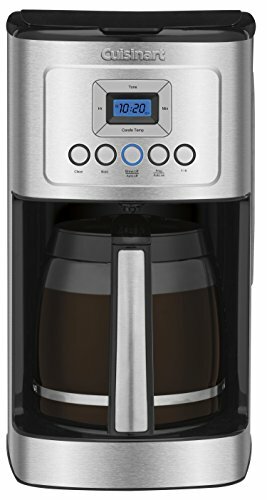 I’m really happy with this coffee maker, having chosen it over the Technivorm Moccamaster Coffee Brewer With Thermo Carafe – Technivorm 9587. It brews extremely quickly (about 7 minutes), and I measured the temperature of the water coming from the spout at about the 195F-200F range, so it’s in the right range for extracting optimum flavor — the brew from this machine is just at the point of being tip-of-the-tongue scalding. The water is dispensed at a number of different points into the filter, and looking at the grounds afterward you can tell that the dispersion pattern works well, as the coffee grounds remain clumped at the bottom of the filter, rather than being thinly spread across the entire filter. Note that this is a minimalistic coffee maker. It is fairly compact, has an unassuming appearance, and there are no glowing dials, no HUDs, no clocks. There’s one control: the on/off switch. It has no timer. It doesn’t have a brew stopper, so you have to let the coffee maker finish before you can pour yourself a cup (since the coffee maker brews so quickly, this isn’t too big of a deal). You cannot navigate your kitchen at night by the light from this coffee maker, nor can you signal passing UFOs. Nonetheless, it makes great coffee. This is our 2nd Bonavita BV1800 in 4 years. They both suddenly stopped working one day around the 2 year mark. We took great care of them both descaling and de-oiling them with the recommended products. Our 2nd one failed yesterday so I decided to disassemble it this morning thinking I could maybe clean it or blow out and buildup. Was shocked to find galvanic corrosion all over the aluminum coil. This is caused by a chemical reaction between the aluminum coil and non aluminum metal in direct contact with it. This includes the steel pump and mount screws that thread into the aluminum on either end, and the heating element. This is prevented on aluminum body cars by using hardware with a special coating. On aluminum boats they use hardware and/or a sacrificial anode. Doesn’t matter how much or little you use it, once a certain amount of time has passed, letting the chemical process reaches a certain point, the electronics will fail and the pump and heater will no longer work. Won’t be buying another one based one what I saw today, we’ll try a Technivorm instead. A pour-over brewing method makes it easy to customize your cup. 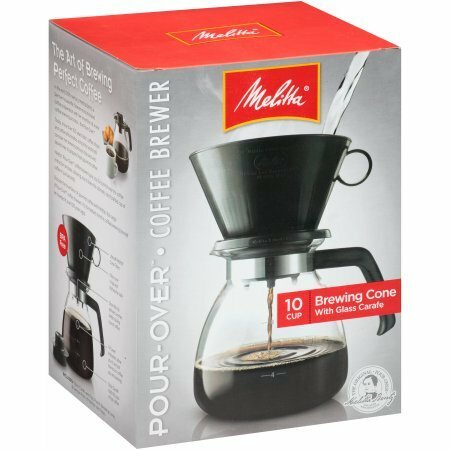 The Melitta Gourmet 10-Cup Manual Coffee Maker uses a carafe and a plastic BPA-free cone to brew coffee using ground coffee and fresh, cool water. To brew, simply heat the water to below a boil, saturate the grinds using a swirling motion, agitate it slightly to eliminate clumps, and enjoy. The slower you pour, the bolder the taste of your brew. PROS: People love the flavorful coffee that results from this brewing method. Many commented how it is the ideal way to brew if you enjoy the taste of coffee because the steeping allows for maximum extraction of the flavors from the grinds. They also like it because it’s easy to use, clean, and store. Some reviewers say they purchased the Melitta to brew a decaffeinated option for guests, while others say they bought it because it’s small enough to store when it’s not in use, freeing up counter space. It’s also an ideal travel companion since it doesn’t require electricity and is small enough to throw in a bag. CONS: Some think it’s too much work for their cup of joe. They would rather push a button on a programmed machine than heat water and pour. Regarding this model, some say it needs a window to view the brewing process to ensure the right amount of water is added. To be honest, it was hard to find negative comments about this model; out of 1,635 reviews, 73% gave it 5-stars. Verdict: If you enjoy the taste of coffee, you need to at least try Melitta Gourmet Pour-Over Coffee Maker. I’m almost certain you’ll love it, but if you don’t, at least you’ll always have it on hand if you need it to brew a cup of decaf or need it when traveling. My Grandmother had one of these in the 70’s. The best coffee maker, very easy to clean and doesn’t take up the whole counter. I’ve had Mr. Coffee, Cuisinart and a Verismo machines. Coffee was okay with the first two and great with the Verismo, but it took up a lot of space, the pods were hard to find, expensive and it was hard to clean. I bought this because Consumer Reports conducted a side-by-side coffee taste test of various coffee makers and this won. I have found that coffee made this way is a little less strong than coffee made with an electric coffee maker like Mr. Coffee, so you have to use a slight bit more coffee. Nevertheless, this makes perfectly good coffee and certainly takes up a lot less space on your counter.